Geoff is a business owner in Broadstone Mill. His business specialises in teaching driving skills to new drivers. Hi, Geoff. Tell us about your business. 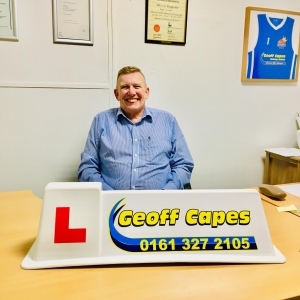 I run a local driving school Geoff Capes Driving School. We have been established for 23 years teaching the people of Stockport and surrounding areas to drive. We currently have 7 driving instructors and my aim for this year is to recruit another 5 by the year end. What attracted a company like yours to Broadstone Mill? I had reached the point in my business where it was outgrowing my house so I investigated moving to a office space and by far Broadstone mill ticked all of my boxes. It has led to my business looking more professional where I can interview people in an office environment and also the added bonus of the use of the meeting room. Has being within the communal space helped with any business challenges? I think it has made my business stand out and be more professional. What’s your favourite thing / hidden gem from the local area? I would say my church St Elisabeth’s. If you think your business would benefit from being within the Broadstone Mill community, email us at info@worksmartservices.co.uk.